Trolls are the most beautiful race on Norrath! This guide is intended to be an overview rather than all encompassing (I apologize for my tendency to write too much). That said, hopefully it's helpful, and I'm happy to have conversations with anyone who'd like to discuss why I play this way or other option. I'll try to check my PM's here, but I'm also happy to talk in game (;t Xegony.Sancus or ;t Firiona.Sancus). The general EQ forums are also a good place to reach me. This is a repost so it's in its own thread. First, I'd like to start with a note on multibinding. IMO it's a crucial part of maximizing DPS as a Mage. I have quite a few multibinds (5 different binds, each with 2 hotbar pages), but I only use two spell sets for raiding, a generic one and one for fights with fire-immune mobs. Mages don't use that many spells, but it's important to be able to change between spells weaves situationally to maximize DPS. The best way to accomplish this is by using multibinds on your hotbars. If you multibind using your spell bar, you're going to constantly have to swap spell sets, which is going to cost you time and flexibility. The other thing I want to focus on is keybinding. A lot of EQ players try to click things like AAs and spells, and it often costs them a lot of time. 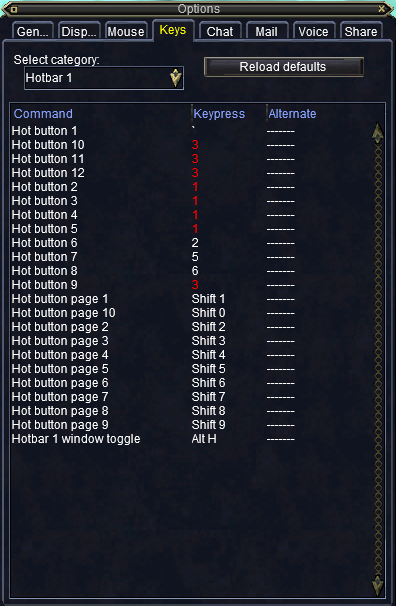 Clicking isn't always bad, but I'd generally recommend keybinding your most used DPS abilities. The main ones I'd definitely keybind are: Force of Elements, Firebound Orb, Twincast, Alliance, Summon Firebound Orb, Improved Twincast, First Spire, Frenzied Burnout, Host of Elements, Servant of Ro, Forceful Rejuvination, /pet attack, /pet swarm, /pet back, /autoinventory, and a burn macro (which I'll share later). You can also keybind other things you use frequently. I have spell gems 1-9 bound to the 1-9 keys on my number pad, which I find very useful if I need to manually cast a spell. Sustained - This is your bread and butter sustained weave to use outside of Improved Twincast. It's important to note that the intent of this weave is that it rotate in the order RS -> Volley -> Chaotic -> Spear -> Chaotic. If you find it's casting in the wrong order, you may have to manually hit some spells to fix it. It is important that Volley gets the Conjurer's Synergy proc, and that you get two Chaotics per rotation. I find a lot of Mages have this rotation set up, but because of lag, recast timers, or other issues, they end up casting it completely in the wrong order which defeats the point of the lineup. Burn (ITC) - You're going to use this weave during Improved Twincast. It isn't crucial that this rotates in order. The basic idea is you're dropping Chaotic and using our 105 Spear. Adds - This spell weave is intended for adds that don't live long enough to have enough pets for of Many. You might also want to start off with one rotation of this weave before switching to your normal sustained weave even on adds that live longer. Magic - If you can't AE, just take out Rain of Knives. I'm not going to focus on Magic DPS too much because it's pathetic, but I figured I'd briefly include a lineup. On General Reparm, you can drop Shock and add in Repudiate the Unnatural (RS -> Rain -> Repudiate > Bolt). Adds (ITC) (Optional) - This spell weave is for adds if you're also using Improved Twincast. This isn't that different from the above weave and you aren't going to use it that often, so it's optional IMO. The main time I use this is when burning piles in Drusella's Vault. Twincast (Optional) - This spell weave is nearly the same as your sustained weave. It rotates Chaotic -> RS -> Volley -> Chaotic -> Spear, which is effectively very similar. I like to use this during spell twincast to make sure I'm maximizing Chaotic casts. Esepcially with lag in raids, it's pretty easy for the normal sustained lineup to drop one Chaotic per rotation, which is bad. This is optional, though, given how close it is to our normal lineup. When do I use "of Many"? Of many does more damage the more pets are on the mob's hatelist. You generally need at least 6 pets to break even, and you need 10 pets to benefit from using of Many. Depending on how many pet classes are in the raid and how on top of target swapping they are, adds that don't live very long often don't have enough pets to make of Many worth it. It's also worth noting that if a mob has no hatelist (i.e. it doesn't show up on xtar), of Many will do no damage to it. When do I use RS? RS has gotten a lot more viable on adds recently, but it still suffers from pathing issues, especially with raid lag. That means it isn't really suited for super-fast add fights. On longer add fights you can more reasonably use it. There is an argument to be made for Chaotic -> RS -> Spear -> Spear on certain adds, but I personally very rarely use that lineup in raids and therefore didn't include it above. How should I manage adds? Mages do not perform well on adds. The damage output of of Many and RS drop noticeably on adds, we can't effectively use Alliance on them, and our spells have both significant cast times and then have to travel at 60 ft/s to do damage. Mages often lose a significant portion of casts on adds due to cast time + travel time. The only fool proof way to avoid losing damage is to stay off adds. That said, often raids require DPS on adds, and if that's the case you have a couple options. The first is to use a fast casting spell like Blistering Sands right before an add dies. The other option is to swap early, either to the boss (to get in an additional nuke in between two adds) or to the next add. When should I AE? I would generally recommend AEing when there are 5 valid targets. If there's a specific point in the fight where you can AE heavily, save Thaumaturge's Focus for it. For the duration of that ability, Beam of Knives does more damage than Beam of Molten Rhyolite. When Thaumaturge's Focus wears off/is not on, just spam Beam of Molten Rhyolite. Force of Elements I don't like putting Force in my multibind because it can cause you to cast spells slightly slower. That said, try to use it during the GCD on cooldown; it's free damage. (Summon) Firebound Orb: Use Firebound Orb on cooldown. I don't like multibinding it because I like to have a bit more control, but it's not a big deal if you do multibind it. Make sure you resummon it whenever you use up the charges, unless you have spell twincast running. Twincast: Use spell Twincast as often as possible. Make sure you have Rank 3. Its recast is so fast that there really isn't any reason to save it; in my experience that generally leads to less damage. I usually start an event with it, and then use it as soon as it's up. Also make sure you never cast twincast when RS is the next spell in your weave. Instead, cast RS and then use twincast, or cast Twincast when Volley is coming up in your weave. Firebound Covenant: Covenant is a spell that debuffs the mob. It has 8 counters that add damage, which can only be used by spells cast by other Mages (with the exception of RS, which cannot use counters). If all 8 counters are used within 18s, it fulminates for 2.7 million damage. There are four important conditions for casting Covenant: 1) You have at least 3 Mages in the raid (or 2 if the other Mage is Twincasting), 2) You are all on the same target, 3) That target will live for 18 seconds, and 4) Another Mage's Covenant is not on the mob. If all of those conditions are true and Covenant is off cooldown, you should be casting it. That means you should use it whenever it refreshes, including with Syllable of Refreshment procs, again assuming those aforementioned conditions are met. It's helpful to have GINA triggers to help know when other Mages have used covenant on the mob; I included that and some other triggers as an attachment to this post. On a burn, you're going to want to activate Heart of Flames, Focus of Arcanum, and Glyph of Destruction if available. You can make a macro for activating if you wish, although the increased cost of Glyph makes it difficult to use on every event. If you're AEing I'd definitely use Silent Casting. Otherwise it honestly shouldn't be necessary, but you can if you aren't comfortable regarding aggro. A lot of Mages try to use First Spire on a burn, but you're wasting it if you have Auspice. Wait until Auspice is over to use First Spire, and then use it on refresh as long as you don't have Auspice or some other large crit chance increase. If you're casting any Magic spells during your burn, include Thaumaturge's Focus. You also want to use Host of the Elements and Servant of Ro. I'd recommend casting RS and then following it directly with Host of Elements, as you can't cast RS while the pets from Host are spawning. Make sure you use both during the GCD so you don't waste DPS. You can also use the summoned clicky pets (Insurgent Minion and Insurgent Servant), but they add very little damage and don't count towards the pet count for of Many. The general opening order should be something like (Firebound Covenant) -> RS -> Host of Elements -> Spell Twincast -> Volley (start Sustained rotation). When Twincast wears off, use Improved Twincast and swap to your ITC weave. You should use Forceful Rejuvenation during ITC to refresh Alliance, RS, and Volley. For your pet, you should pre-buff it with Frenzied Burnout (which also casts Virulent Talon) and Zeal of the Elements VIII, and suspend it prior to the fight. Unsuspend it a few seconds before the fight begins. Refresh Zeal of the Elements when it wears off, and refresh Frenzied Burnout when it and Virulent Talon have worn off. Use Thaumaturgist's Infusion when the second FBO wears off. Burn ADPS: Illusions of Grandeur (Enchanter; Crit Damage/Rate), Group Spirit of the Black Wolf (Druid; Crit Damage/Rate), Chromatic Haze (Enchanter; Crit Focus), Quick Time (Bard; Spell Haste), and Auspice of the Hunter (Ranger MGB; Crit Rate). Enchanter/Bard dicho are also cool. You want your enchanter nuking to proc Gift of Chromatic Haze and Beguiler's Synergy. Any other caster Synergies you can get (Conjurer's, Evoker's, Defiler's) are cool too. Auras/Songs: Mana Repetition Aura (Enchanter; Proc), Twincast Aura (Enchanter; TC Chance), Frostreave Aura (Druid; Proc), Aura of Begalru (Bard; Swarm Pet Haste/Focus), Aria of Begalru (Bard; Focus), Qunard's Aria (Bard; Damage Add), Arcane Ballad (Bard; Proc). There are other songs that give pets procs, but they aren't that good and I don't know what they're called. Primary/Procs: You should be using a 2HB with the highest damage proc you have access to. The best option is Ascending Sun Arcane Staff. Use Elemental Curio of Ondine Force and Bone Shards of Frozen Marrow. Use Sodkee's Sympathetic Stone in your Range and a belt with Threads of Potential or Boon of Potential as a focus. If you're able to get them, the TBL evolving items allow you to gain two casting procs (Whispering Midnight & Blazing Euphoria Casting Fire) and two melee procs (Whispering Mindight & Blazing Euphoria Assaulting Magic) that are worth having. Important Foci: Your important foci are your Robe (Spear Focus), Ear (Pet Focus), Arms (Fire Focus), Legs (Det Spell Haste), Back (Mana Pres), Head (Magic Focus), approximately in that order of importance. Apart from those slots and your primary, gear isn't that important. Dragonmagic Focus/Purified Mana Tonic: These are the two relevant RoS potions. The former is a 10k damage proc potion, and the latter is a 1-5% mana preservation potion. You should always be using the former, and always use the latter if you have mana issues. Glyphwielder's Tunic of the Summoner: This robe has Thaumaturgist's Infusion, which is a weaker version of FBO. It lasts for 1 minute and has a 5 minute re-use. Pet Clicks: Anything you can use to increase pet counts can be useful. The two easiest ones are Cloth Cap and Vicious Rabbit. Bifold Focus of the Evil Eye: If you're lucky enough to have this, use it as much as possible. Chaotic Inferno is the best spell to use it with, since it can proc 18s of Twincast. Type 3's: This should go without saying, but get your Type 3 augs for all of your spells. You should have Eyes of Life and Decay too. This is a bit of a misc. section for things that aren't important enough to include in their own section. Buffs: You want spell haste, Elemental Form: Fire, and Arcane Distillect. Your pet should have Burnout, Iceflame Keep, as many runes as you can layer, and assorted melee buffs. Thaumaturge's Unity should suffice for most self buffs. Mana Regen: You have a lot of sources of Mana Regen. These include Glowing Modulation Shard (AA Mod Rod), Wand of Arcronite Modulation (Spell Mod Rod), and Elemental Conversion. If you run out of mana, you can use Monster Summoning + Reclaim Energy to get back up. You should get an instant cast reclaim click (e.g. Staff of Elemental Mastery: Earth). Survivability: Your best survivability tool is Shield of Order, which significantly mitigates AE damage. You also have Shield of Elements, which is a rune. Beyond that your options get worse, but you do have Shared Health, Heart of Ice, and Heart of Stone. For aggro, you have Drape of Shadows and Arcane Whisper. Debuffing: The Malo AA now casts the same version as the spell, so we can fairly easily ensure that mobs are debuffed. Wind of Malo is especially useful on adds and because it's instant cast. As our spells have no resist adjusts for the most part, it's important to ensure mobs are as debuffed as possible. If anyone has any questions/comments, or wants to have a more in depth discussion, you're welcome to post, PM me, or send a tell. Thanks for taking the time to write up a guide for the current expansion (RoS), Sancus! I've sticky posted the thread, so it stands out as well. I don't play a Mage, but I read through your guide. There's some interesting points around sustained DPS and how Mages are not as effective on adds, and the reasons why. But of course, as you said in the post; and I agree, raids often require DPS on adds. It's nice how you point out which spells and how to handle DPS on adds in this regard. I like how you go through the spell weaves, and break them down, but also have optional sets for different situations. If I were playing a Mage. I would probably approach your guide in stages. First, working on setting up the binds/keys, and focusing on the Sustained and Burn ITC lineups, practicing and getting them down pat (I'd also setup the Burn /alt act hotkey in the related area too). For me, I think that would be the biggest bang on return from the outset. Once comfortable with the above setup, I'd hone in on the details for the optional sets you outlined, and then focus on incorporating the points in the Additional DPS Abilities/Spells (Sustained), area. From there, I'd look at Utility/Mana Regen/Buffs, and back up at the ADPS area, and see whether or not I'm getting what's available in my group/raid in that area and work on getting folks on board with what's missing, if anything. Side-note, we assign TB/MGB ADPS coordinators on raids. I think folks should also be conscious of where their own group ADPS is coming from. For example, as a Mage, I would want to be near my Druid/Enc (and them together), so that I'm in range of their ADPS. In my downtime, I would review my gear, and see what I'm missing compared to your list in the Items section. Your guide is thorough, and includes a wealth of information, thanks again! The reason I mentioned how I would tackle your guide in stages, is exactly because the guide contains a lot of useful information. Absorbing it in chunks, I would hopefully avoid being overwhelmed, and possibly discouraged. I think taking it in stages, applying/practing and becoming comfortable, and then applying more, is easier to manage. We tend to sport several Mages on our raids. If you want to attach your GINA trigger for Firebound Alliance to the guide, that'd be great. It's okay if you don't though. Re: Make sure to use Alliance after Syllable of Refreshment procs as well. Remember, I don't play a Mage. Do you mean cast FA on the target after SoR procs regardless whether or not the target already has FA? Re: Wait until Auspice is over to use First Spire, and then use it on refresh as long as you don't have Auspice or some other large crit chance increase. Do you use a trigger overlay, so you can know when spice is running or rely on your temp buff window? I would think an overlay would be more efficient, as spice can land in different spots in the temp buff window. Hopefully other Mages chime in with their feedback/thoughts as well. Cast mod rod when joining raid. set 10 min timer. Cast mod rod. Cast mod rod when about to engage. PS if furro asks for COTH make sure to announce it in /rs! Thanks Furro. I think that approach to the guide makes a lot of sense. It is a lot to implement at once, so I'd take it in parts. The same thing goes for keybinding if you're used to clicking things; I think changing all of your abilities to keybinds right at once can be a bit daunting. Instead I'd recommend taking it slow and getting used to a few keybinds at a time. Firebound Alliance: Alliance is a spell that debuffs the mob. It has 8 counters that add damage, which can only be used by spells cast by other Mages (with the exception of RS, which cannot use counters). If all 8 counters are used within 18s, it fulminates for 2.4 million damage. There are four important conditions for casting Alliance: 1) You have at least 3 Mages in the raid (or 2 if the other Mage is Twincasting), 2) You are all on the same target, 3) That target will live for 18 seconds, and 4) Another Mage's Alliance is not on the mob. If all of those conditions are true and Alliance is off cooldown, you should be casting it. That means you should use it whenever it refreshes, including with Syllable of Refreshment procs, again assuming those aforementioned conditions are met. It's helpful to have GINA triggers to help know when other Mages have allianced the mob; I included that and some other triggers as an attachment to this post. Hopefully that's a bit clearer; Alliance will bounce if another Mage's Alliance is on the mob, so you definitely should wait for theirs to fulminate/wear off. I also attached a trigger package to the bottom of the post. These are just some of the triggers I personally use; I'd definitely recommend people play around with GINA to see what works best for them. I basically included some ADPS triggers, including Auspice, triggers for Syllable of Refreshment and Twincast, and Alliance triggers. The Alliance trigger starts a timer when another Mage starts casting Alliance, and the timer ends early if theirs fulminates. It also has a trigger for when your own Alliance fulminates. Using the actual casting message isn't perfect, as the other Mage can get interrupted or their Alliance can bounce. That said, I think it's more useful than using the Alliance landing message since 1) it notifies you a few seconds earlier and 2) the alliance landing message has a significantly shorter reporting range. You can use both though. The trigger for your Alliance fulminating uses the damage message, so in theory it's possible you cast a spell that does exactly as much damage as your Alliance. That's incredibly unlikely though, and the fulmination message has a very short range, so I think the damage message is a better option. One final thing - it's not a bad idea as a Mage to figure out when Auspice is going out ahead of time. Some guilds list rotations somewhere, or you can just talk to your rangers and ask them when it's getting used. Or just get a gina trigger when it lands and wears off. I think Sancus was mainly driving at having a plan of attack for burns before you start the event. You will always perform better with an outline of your adps beforehand, that's the difference between doing 2 mini burns and 1. Can be a 100k+ DPS difference at the end of the fight vs if you just fly by the seat of your pants and deal with things as surprises. First, I definitely agree that an Auspice trigger is useful for Mages. There's one included in the trigger package I attached. That said, I don't think it removes the need for understanding when Auspice will be going out. At a basic level, your goal is to not waste First Spire, while also getting it out as frequently as possible (it only has a 7:30 reuse). Triggers are great at telling you that Auspice is on, and therefore that you shouldn't use First Spire. However, they do nothing to tell you when the next Auspice is going out. That creates the very real possibility that you use First Spire, and 5 or 10 or 30 seconds later Auspice goes out. You've then wasted an ability, and a trigger wouldn't have helped. Going beyond just First Spire, like Fintank said, you want to plan out your adps beforehand. Your general goal is to maintain a high crit rate, with the additional goal of having a high crit when other modifiers are present (e.g. crit damage modifiers or twincast). ADPS ends up being a bit like a puzzle, where you have to fit quite a few different abilities together to yield the highest sustained DPS. To give an example of this, here's a document I used to use to coordinate ADPS on Defense of Lendinara (WK 2 in CotF). Coordinating ADPS to that level is a bit unnecessary, but I think the format helps illustrate how a number of abilities fit together in an effort to maintain a high crit rate. It's not really possible to effectively do that if you don't know how Auspice is being used. Thanks for expanding with more detail on FA. Some conditions to get used to there, but I guess as a Mage, it becomes a habit after using it a bit. Thanks for including your trigger package. I hope you don't mind, I have some suggestions for some of the regex. I work with regex often in the stuff I do outside of EQ as well. Note: FA isn't an AA (yet! ), but if it was, the above trigger would still work. Also, AA's tend to display ranks starting at I, whereas spell book spells do not currently, that I know of. Remove the 3rd capture group (surrounding the 'for ' word), which seems to be superfluous. Mainly for less noise in the trigger pattern. Performance wise, it depends on the language whether or not there are gains. Include the period and end of string anchor, as you have in some of the other triggers. Include a start of string anchor in this trigger. Just to chime in on this. I agree as well, it's good to know when spice (and other TB/MGB abilities for that matter), are going to occur (at least ballpark anyway). For FL raids, as mentioned, we do assign coordinators, and do indicate which stages for x, y, z. But we don't have a time-lines in place for all events. This is an area we need to work on. I also agree with your spreadsheet example, while it may be a bit unnecessary, it does give an overview of how ADPS can align. We tend to try and get a time-line down to a hotkey, for x stage do this spread, for adds, that spread, type of thing. Having coordinators helps delegate this out, as they can be on/remind people for next spice/etc. For FL, ADPS in general is an ongoing work in progress (WIP). Dicho can be added in for aggro management if ever an issue. Banestrike and Force of elements are instant casts so can be placed in the same social for spam as they refresh. BS is 1 min vs 20 secs for FoE. Great guide . Thanks Sancus for taking time to put this together. I've been out of the loop for some time so not up to speed on new things. What's the best belt for mages these days? Runed Belt of Boromas https://eq.magelo.com/item/147558 is still good? The info from the thread on ToP vs BoS vs Sympathetic Proc on DBG is still valid. Raid mage should see greater dps due to crit mods with Belt of Boromus. This isn't exactly a guide, but I thought it was worth mentioning this here. Piemastaj (an RoI Mage) and myself are creating a Magician Discord to facilitate discussions, information sharing, posting guides, etc. This is very new (we decided to do make it Monday), but I've compiled quite a few resources already. You can join via this link: https://discord.gg/8QdRGrs Also open to any feedback/suggestions/requests. You can message me at Sancus#5102. Also, I will update this guide soon (tm). Elemental Union was nerfed, which is a notable change. TBL didn't bring too many changes, but there's a few other things to update. Going to wait until I have more time in raids to get a better feel for what to use. Preliminary TBL update done. Not much changed; I mainly added the new Covenant/Bolt and removed Elemental Union. It's possible there will be additional updates as I optimize more. It's worth noting the new GINA Triggers should be updated for the syntax changes coming with tomorrow's patch, so they won't work until after then. If there are any questions/comments let me know as always.